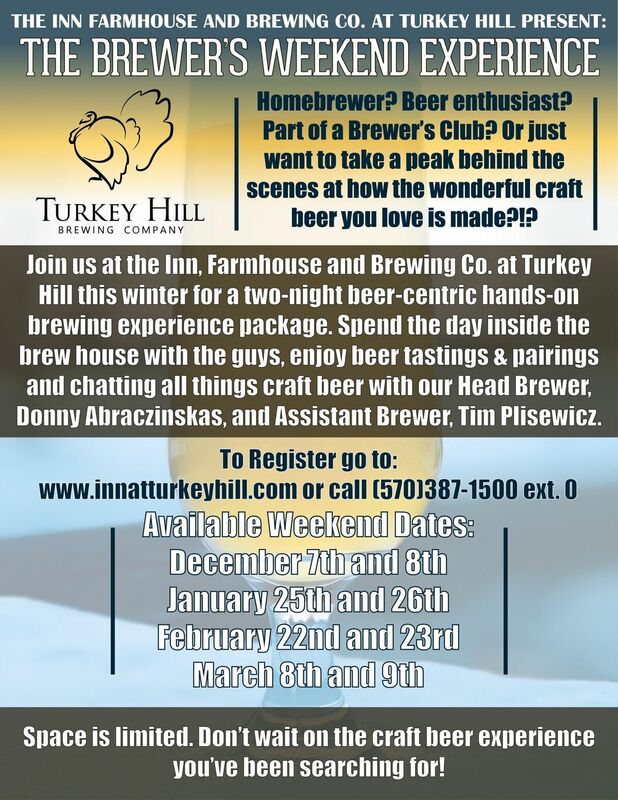 Turkey Hill Brewery Co. | Craft beer, Great food and Live music along I80 in Bloomsburg, PA. The Brewer’s Weekend Experience – Homebrewer? Beer enthusiast? Part of a Brewer’s Club? Or just want to take a peak behind the scenes at how the wonderful craft beer you love is made?!? Donny Abraczinskas is living his dream as the Brewmaster for Turkey Hill Brewing Company. More than a B&B, our country inn gives all travelers, for business and pleasure alike, the opportunity to indulge in our tastefully appointed guestrooms, critically acclaimed restaurant and recently opened brewpub. We believe in serving the highest quality of food with an emphasis on buying local, organic produce and meats. Head Chef, Steve Bigger, and staff prepare fresh ingredients on a daily basis to ensure our customers’ utmost satisfaction. The menu is a blend of Americana pub food with splashes of international flavor influences featuring All Organic Grassfed Burgers from Fork’s Farm, Salmon from Wild for Salmon and Ahi Tuna salad. Everything pairs perfectly with a house-brewed beer.